During the week "Progettiamo un Molise Solidale" (29 May-3 June 2016) some of the Tchau project guys have visited Campobasso. Follow the reports written in portugues by the boys with their impressions. The Italian culinary courses and confectionery started. Here are the photos of the dishes prepared in the first weeks of lessons. 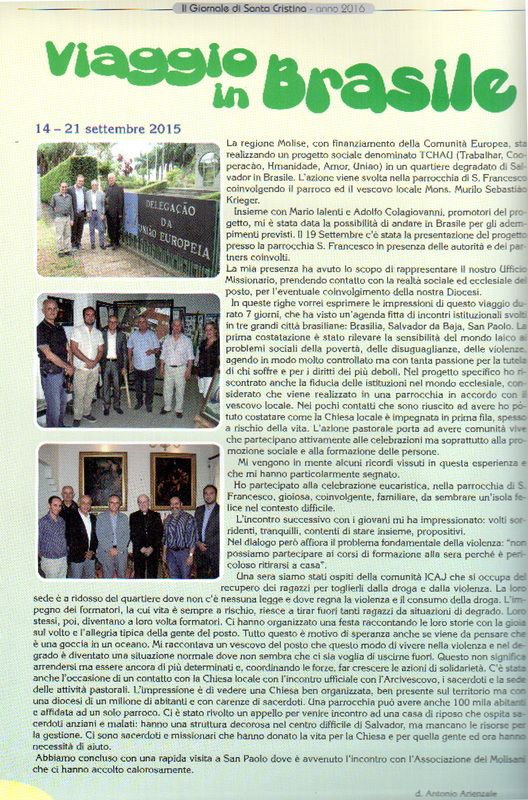 The courses planned in the project began in the parish and at the headquarters of ICAJ. In the parish of St. Francis the information table of the project has been exposed. Available for download the Press release of the President Frattura about Project tchau and cooperation between Molise and Brazil (in Italian only). Available for download the minutes of the application of the TCHAU Project to MESA BRASIL Program (in Portuguese and Italian). Last night has been realized the last meeting between Jose Maria Alvarez, tutor indicated by the European Union to follow the TCHAU Project, and representatives of community in the neighborhood of Boca do Rio. Now the coordination of the project is meeting with the tutor to hear his impressions and recommendations for the continuation of the project. Friday, September 18 full day of satisfaction and many positive feelings.